Pakistan’s Defence Export Promotion Organization (DEPO) has confirmed that Pakistan has received four Mil Mi-35M assault helicopters from Russian Helicopters. The statement was issued by DEPO’s Brig. Gen. Waheed Mumtaz during the 2017 International Military-Technical Forum (Army 2017), which took place in Moscow between August 22 to 27. “The contract was signed, we received all four cars [Mi-35M] and now we get new equipment,” said Mumtaz responding to a journalist (via the RIA Novosti News Agency). Pakistan ordered four Mi-35Ms in August 2015 in a $153 million U.S. deal, which included training, spare parts and ground support equipment. It was Pakistan’s first true weapon purchase from Russia. The Mi-35M is a modernized variant of the Mi-24V Hind, a popular Soviet-era attack helicopter based on the ubiquitous Mil Mi-8/17 Hip transport helicopter platform. As a result, the Mi-35M encompasses many improvements, among them an integrated countermeasures suite and ability to deploy guided weapons. Powered by two TV3-117VMA or VK-2500 turboshaft engines, the Mi-35M can deploy anti-tank guided missiles (ATGM), guided and laser-guided rockets and gun-pods. Besides its two aircrew, the Mi-35M can also carry eight armed personnel in its cabin and ferry cargo of up to 2,400 kg with a sling. In May, Rosonboronexport announced that a newer version, the Mi-35P, was also eliciting interest from overseas. The state-owned arms-trade body revealed that it was in negotiations with several countries. Brig. Gen Mumtaz told RIA Novosti that Pakistani aircrews were acclimating to the Mi-35. However, upon the conclusion of this program, Pakistan will examine the notion of procuring other Russian weapons, be it additional helicopters or armoured, aviation and naval systems. In 2015, IHS Jane’s had reported that Pakistan was interested in expanding its Mi-35 order – it aimed to procure up to 20 Mi-35s in the coming years. 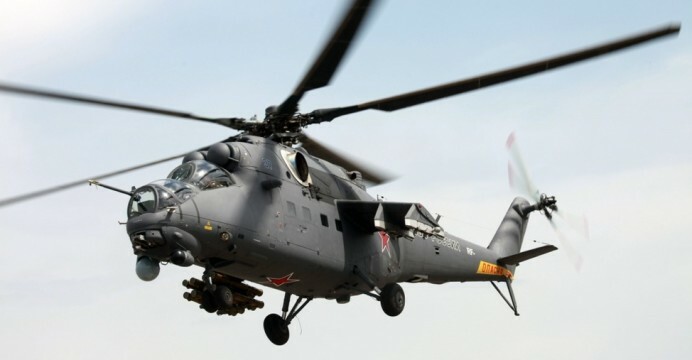 Pakistan was also negotiating with Rostec for a maintenance, repair and overhaul (MRO) centre to fully support its Mi-17/171 and Mi-35 helicopters. The Pakistan Army is in the process of modernizing its attack helicopter fleet to cope with close air support (CAS) requirements for counterinsurgency (COIN) and anti-armour operations. It appears that the Mi-35M could factor into the former by enhancing Pakistan’s air assault capabilities, i.e. provide a dual-armed and transport platform for inserting and extracting infantry in hot-zones. This is separate from the Army’s push to replace its legacy AH-1F/S Cobra attack helicopters, which will be supplanted by the Bell Helicopter AH-1Z Viper and another platform, potentially the Turkish Aerospace Industries (TAI) T129 ATAK. Its engine and dynamics parts (e.g. top and tail rotors) commonality with the Mi-171 makes the Mi-35M a relatively smooth addition to the Pakistan Army’s fleet. The possible inclusion of a complete MRO hub within the country would increase the affordability of operating these platforms. The Mi-171 is also seeing adoption in Pakistan’s civil services (with the Baluchistan government acquiring a single aircraft in July). It is not known how the Pakistan Army will equip the Mi-35Ms, especially since the armed forces already possess various electro-optical and infrared (EO/IR) sensor pods and guided munitions. Extending the usage of these systems from the Mi-35M would reduce logistics and support costs. The Barq laser-guided air-to-ground missile (AGM) produced by the National Engineering and Scientific Commission (NESCOM) for use by the Burraq armed drone could be an ATGM/AGM option for the Mi-35M. Since 2015, an assortment of media reports and open-ended official statements had alluded to Pakistani interest in big-ticket Russian armaments, including the Sukhoi Su-35 Flanker-E multi-role fighter, Mi-28NE Night Hunter attack helicopter and S-400 Triumf long-range surface-to-air missile (SAM) systems. Brig. Mumtaz’s statements to RIA Novosti may imply that the Mi-35 is a pilot that could pave the way for big-ticket sales to Islamabad. With its bilateral defence ties with the U.S. in a precarious state, Pakistan does view Russia as a prospective defence supplier, especially for high-tech systems. The clearest statement to this effect had come from the Pakistan Air Force’s (PAF) Chief of Air Staff (CAS) Air Chief Marshal (ACM) Sohail Aman. In an interview with Bol Narratives (published in April), ACM Aman stated that the PAF required a new combat aircraft type to complement the JF-17 and F-16, and that the PAF has “Chinese and Russian options.” It remains to be seen if Pakistan will pursue the Su-35, though it is among the more affordable options to acquire, with incremental or small-batch purchasing options (as shown in Indonesia’s recent purchase of 11 aircraft) no less.